As we come up to the final two races of the 2014 Formula One season, the double points mechanism for the final race means that two drivers are still in with a shot at the Drivers’ Championship: Lewis Hamilton and Nico Rosberg. Hamilton needs 51 points in the remaining races to be champion if Rosberg wins both races. Hamilton can afford to finish second in Brazil and at the double points finale in Abu Dhabi and still be champion. Mathematically he could also finish third in Brazil and second in the finale and take it on win countback, as Rosberg would have just six wins to Hamilton’s ten. If Hamilton leads Rosberg home again in a 1-2 in Brazil, then he will go to Abu Dhabi needing to finish fifth or higher to be champion (echoes of Brazil 2008!!). If Rosberg does not finish in Brazil and Hamilton wins the race, then Rosberg would need to win Abu Dhabi with Hamilton not finishing; no other scenario would give Rosberg the title. 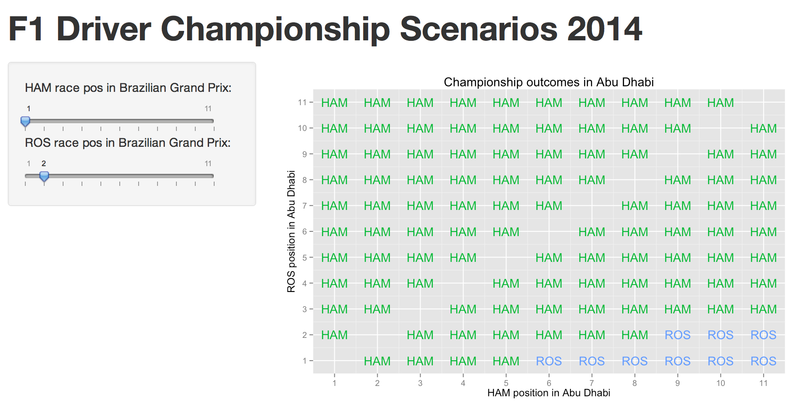 A couple of years ago, I developed an interactive R/shiny app for exploring finishing combinations of two drivers in the last two races of a season to see what situations led to what result: Interactive Scenarios With Shiny – The Race to the F1 2012 Drivers’ Championship. When I get a chance, I’ll weave elements of this recipe into the Wrangling F1 Data With R book.